The election is a mere one day away. Let's take a look at the different paths to victory in the electoral college each candidate has for tomorrow's election. I suppose that it should be pointed out, for those unfamiliar with the process, that regardless of the vote totals, it's the electoral college that will determine the winner, not the popular vote. I won't go into the history or the pros and cons of the electoral college; those can be found on the internet elsewhere fairly easily. (For the record, I think the electoral college is a good idea for a variety of reasons, but mostly because it makes election administration easier and it has the effect of forcing candidates to appeal to different demographics.) In any case, regardless of how you feel about it, the electoral college is how the next president will be elected, like it or not. A quick note about polls: I went over how polls work on yesterday's post, but it might be useful to get a little more specific for this analysis. Generally speaking, nearly all of the "unknown" factors will trend towards Romney. Historically, undecideds break for the challenger. While the proportion who do so varies quite a bit, and it's not an absolute rule, it's highly likely that undecideds are going to break towards Romney. In addition, 2008 was such an unusual situation demographically (mainly the abnormally high turnout by first-time voters) that the formulas used by pollsters have a greater chance of error. While this technically could go either way, it's most likely that the demographics will be understated for Romney and turnout will (probably, though not definitely) favor him. Obviously, none of this can be confirmed until Election Day, but it's worth pointing out when you are looking at the polls. If you're looking for information about the electoral college--or, more importantly, want to play around with the maps, which is a perfect way of getting a good idea of how each candidate can win--there are several good websites to go to. Electoral-vote.com has a simple setup; you can look at the map at a glance and it has raw data for polls. The analysis can be a little iffy and the interface a tough clunky, but it's probably the best stop for beginners and has probably the best poll-averaging policies. Sadly, it does not have an interactive map. Realclearpolitics.com has the best set of information and analysis and is my preferred site; it's easy to use and has plenty of analysis from both sides. The interface is pretty much perfect, with enough information to give you both a snapshot picture of the race as well as enough historical context to see how things could go. Its interactive map is a little too complex (perfect, though, for people like me) but not so good for easily playing around with. fivethirtyeight.com is the resident pollster/electoral college analyst for the New York Times, headed by Nate Silver. I don't care for either Silver, his analysis, or the site itself, but plenty of people use it and seem to like it. CNN has a very basic electoral map. It has no analysis to speak of, and it rarely ever updates, but it has by far the best interactive map. This is the place to go to play around with the state totals. There are nine states that are considered swing states--states that are close and that either candidate could conceivably win. These states (and their electoral votes) are Ohio (18), Florida (29), Nevada (6), New Hampshire (4), North Carolina (15), Virginia (13), Iowa (6), Wisconsin (10), and Colorado (9). All other states are safe for one candidate or the other (with a few exceptions, which we'll go over later); this puts the total at Obama: 237 and Romney 191. 110 electoral votes are thus up for grabs. The candidate to get to 270 wins the presidency. Obama clearly starts off with an electoral advantage, only needing 33 of the 110 electoral votes to win. Of course, it's not that simple. Romney needs, needs, needs Florida. Florida is a must-win for Romney. If he loses Florida, he would have to win every other Swing State save New Hampshire to win, and quite frankly that is nearly impossible. Effectively, if he loses Florida he's lost the election. So all scenarios below assume he is going to win Florida, since otherwise he is done. The good news for the GOP is that Romney has led in Florida for quite some time, and while the polls have tightened recently all of the demographics seem to be favoring him. Obama also won with less than 3% last time, in an election year that favored him greatly. Romney has a decent chance (though by no means certain) of winning it. This puts the gap to 237 Obama - 220 Romney, a much more competitive landscape. Romney is probably going to win North Carolina. While Obama unexpectedly won North Carolina in 2012 and the race has been close, Romney has led here for a while. In fact, up until about a week ago he had been leading above the margin of error for almost a month, so much so that CNN stopped calling it a swing state. Of course, it did end up swinging back to toss-up status, but chances are that Romney will win this state as well. We'll still look at scenarios where Romney loses NC, but baring some odd surge in the polls it seems unlikely at this point. At this point the contest is practically even at 237 Obama - 235 Romney. Now it's a race. All other states are now more or less within the margin of error, so they can honestly go either way. With Ohio's 18 electoral votes, Romney will need this to stay competitive. Since many of the other states have been trending for Obama, it's going to be a lot easier for Obama to pick up the remaining 15 votes (to get to 270) then it is for Romney. If Romney wins, he still has an uphill battle with the remaining states, but if Obama wins his options become severely limited. For example, if Obama wins Ohio, he only needs to win North Carolina or any two other states (except New Hampshire) to win. The good news for Obama is that he's been leading in Ohio for months. It is highly likely that he will win. It's still within the margin of error, of course, so turnout and undecideds can always make it much closer, but there's a good chance that Obama will win Ohio's 18 electoral votes. Still, either candidate can cobble together states to overcome a loss in Ohio. It's just a lot easier for Obama than Romney. As noted above, the chance of Obama winning Ohio is pretty good. While the demographics and turnout favor Romney, the 3% lead Obama has enjoyed, even though it's within the margin of error, has been consistent enough that it seems solid and it will be very difficult for Romney to crack. So what options does Romney have if he loses Ohio? 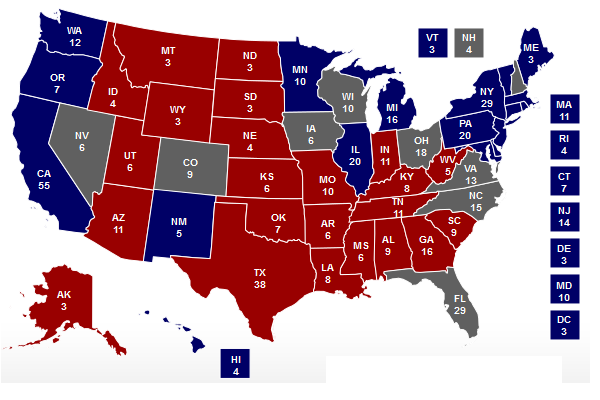 Assuming a Florida and North Carolina win and an Ohio loss to Obama, Romney will need 35 electoral votes to win. He can make up for the Ohio loss by winning both Virginia and Wisconsin, and then winning some combination of the rest: Colorado, Nevada, Iowa, and New Hampshire. He can win Colorado and any other state, or both Iowa and Nevada. He can lose Wisconsin and make up for it in Colorado (and can be interchanged above), but the one-vote loss at that point will make things a little tighter. Virginia is nearly a must-win if he loses Ohio, since that means Obama only needs two more electoral votes to win. The problem for Romney is that if he loses Ohio, there's a pretty good chance he will lose Wisconsin as well, which has very similar demographics. This means he will have to rely on every other swing state to win. The most likely Ohio-less Romney victory is winning Wisconsin, Florida, North Carolina, Virginia, New Hampshire, and Colorado. Obama would then win Nevada, Iowa, and Ohio. If Romney wins both Nevada and Iowa he can lose any other state and still win. A monkey wrench in this entire analysis is Maine's second congressional district. It is possible, due to Maine's electoral distribution rules, that Romney wins one electoral vote here. This actually opens up a few more options for him--a lot of the totals above are only one or two votes to victory--but quite frankly if Romney wins this district he is going to have a pretty good night anyway. Two solidly Democratic states, Pennsylvania and Michigan, have been oddly close this election season. While still outside the margin of error, Obama has less than a 5% lead--and since there are still 2-3% undecided in each state, it's not unreasonable to think that Romney could pull it off. This is especially notable in Pennsylvania, where Hurricane Sandy might cause less than the expected turnout in Philadelphia. If Romney somehow wins either of these states (with 20 electoral votes for Pennsylvania and 16 for Michigan), it cracks his opportunities wide open--he can start losing other states (like Ohio) without many problems. Although, again, if Romney is winning states like these, he's probably going to win anyway. There are a few other states that are unexpectedly close. Minnesota, in particular, is oddly close, though still outside the margin of error. In Obama's favor, Arizona is also somewhat in play. Since the electoral prizes for these are smaller and the polling not as close as the others, these haven't been getting much attention and are unlikely to change from the expected winners. But if somehow Romney wins Minnesota, it will let him roughly make up for a Wisconsin, Colorado, or even Virginia loss. Add into this the chance that Romney wins Maine's 2nd congressional District, and there are even more opportunities for a tie. I won't go through them all, but one of them is Romney winning Ohio, Colorado, Florida, North Carolina, and Iowa and Obama winning Wisconsin, New Hampshire, Nevada, and Virginia. In a tie, each state in the House votes for one of the top three candidates (for practical purposes, Romney and Obama) with each state getting one vote. Romney would definitely win this one. The senate would elect the Vice President; in this case, it would be Biden, since the Senate would be controlled by the Democrats. While this is an unlikely scenario, the possibility is certainly there. Game Plan for Romney: If he can win Florida, North Carolina and Ohio, and then win Virginia and any other state, he wins. (Virginia and New Hampshire would put him at 270, the minimum required to win.) If he loses Ohio, he had to get most of the high-count swing states to win. Game Plan for Obama: Win Florida and you can go to sleep--he just needs one more state (even New Hampshire) to win. Otherwise, win Ohio and North Carolina--or any equivalent 15-vote combination, which shouldn't be hard--and you win. Lose both Florida and Ohio, though, and you have to start sweeping everything else. The Polls: Right now, it looks like Romney will take North Carolina. He is up in Florida. On Obama's side, he's consistently polled high in Ohio and Wisconsin, so will probably take both of those. Virginia and Colorado are less than 1% difference, so they are true tossups. The remainder (New Hampshire, Iowa, Wisconsin, and Nevada) are trending Obama, but all are within the margin of error. Although Wisconsin and North Carolina look like they are locked pretty good (for Obama and Romney, respectively), these states are well within the margin of error and could go either way. Warning Signs: If Romney wins Maine's 2nd district, it will probably mean a good night for him--it means the undecideds and turnout is favoring him. A Pennsylvania win would mean the same thing (and almost assures a victory--if Romney is winning PA, he's probably winning in places like Ohio and Wisconsin). If Obama take North Carolina, it's going to be a long night for Romney. Tomorrow--election day!--we'll take a more in-depth look at what to watch out for throughout the night.